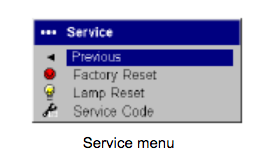 Be sure to replace the lamp when you see the message “Change lamp” It may also be time to replace the projector lamp if you notice the colors on screen have faded or become distorted. no guarantee or refunds – you’re on your own to get a refund from the company when you buy from a reseller. 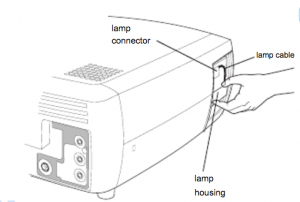 Reduce the risk of electrical shock by disconnecting the power cord on the projector. Reduce the risk of severe burns by allowing the projector to cool for at least 45 minutes. It should be cool to the touch. tab on the connector and lightly pulling it free. Be extremely careful when removing the lamp housing. Carefully remove the lamp housing. 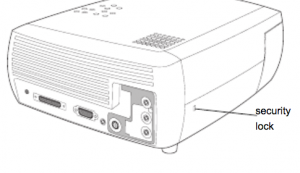 NOTE: The Dukane 456-7300 projector lamp contains mercury and should not be thrown into regular garbage. Recycle your used lamps! Install the new Dukane 456-7300 lamp housing and tighten the screws. Re-attach the lamp connector to the projector. The locking tab should engage when the connector is fully plugged in. 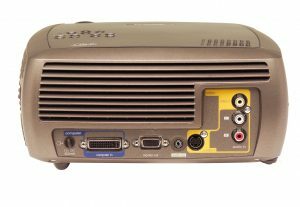 It’s important to set the lamp timer so the Dukane ImagePro 7300 projector can accurately track the life span of the Dukane 456-7300. After replacing the Dukane ImagePro 7330 be sure to clean the lamp filters. If the dust filter becomes clogged it will cause high temperatures and premature lamp failure. To maximize lamp life you should clean the screen every 250 hours. Examine the dust filter screens on the lamp housing. If necessary, use a vacuum cleaner set on low power to clean the screens. Be careful not to disturb any internal components when cleaning the screens. Replace the lamp housing and lamp door.